Radiculopathy is a clinical condition which involves one or more nerves resulting in impaired function (a neuropathy). The site of injury in radiculopathy is at the level of the spinal nerve root. The result is pain (known as radicular pain), weakness in limbs, numbness/parasthesia, and difficulty in controlling specific muscles. In a radiculopathy, the problem occurs at or near the site of the origin of the root of the nerve as it exits from the spinal cord, but the pain and accompanying symptoms usually radiate to the part of the body that is supplied by that specific nerve. For example, a nerve root impingement in the cervical spine may result in pain and weakness in the forearm. Similarly an impingement in the lumbar region can be manifested with symptoms in the foot. The radicular pain that results from a radiculopathy should not be confused with referred pain, which is different both in mechanism and clinical features. Polyradiculopathy is a condition in which more than one spinal nerve roots are affected. Cervical radiculopathy is found to be less prevalent in the USA than lumbar radiculopathy, with an overall occurrence of 83 cases per 100,000 populace. The most common age group for cervical radiculopathy is found to be 45-64 years with 51.03% of incidents. Female gender is considered to be a risk factor and are affected more frequently than male counterparts,accounting for 53.69% of cases. Private insurance is found to be the paying party in 41.69% of the incidents followed by Medicare in 38.81% incidents. Geographically,the South is the most severely affected region in the US with 39.27% of cases. According to a study cinducted in the state of Minnesota, the most common site is the C7 monoradiculopathy, followed by C6 . Radiculopathy is a mechanical compression of a nerve root usually at the exit foramen or lateral recess. It may be secondary to degenerative disc disease, osteoarthritis, facet joint degeneration/hypertrophy, ligamentous hypertrophy, spondylolisthesis, or a combination of these factors. Rarer causes of radiculopathy may include radiation, diabetes mellitus, neoplastic disease, or any meningeal-based disease process. Radiculopathy can occur in any part of the spine but the most common site of radiculopathy is the cervical (Cervical Radiculopathy) and the lumbar spine (Lumbar Radiculopathy). It is less commonly found in the middle portion of the spine (thoracic radiculopathy) . Cervical radiculopathy is defined as a disorder affecting a spinal nerve root in the Cervical Spine, therefore a knowledge of the brachial plexus is crucial to understanding the impact of nerve root impingement or damage has on the body. We have 8 cervical nerve roots, for 7 cervical vertebrae and this may seem confusing at first. However a nerve root comes out of the spinal column between C7 and T1, hence C8 as T1 already exists . Lumbar radiculopathy is a condition in wich pain is caused in the lower back and hip radiating down the back of the thigh into the leg. It is caused by damage to one of the lower segments of the spine, ranging from L1 to S1 caused by compression of the nerve roots which exit the spine. Certain injuries can also lead to radiculopathy. These injuries include lifting heavy objects improperly or suffering from a minor trauma such as a car accident. Less common causes of radiculopathy include injury caused by tumor (which can compress nerve roots locally) and diabetes (which can effectively cause ischemia or lack of blood flow to nerves). The symptoms of radiculopathy depend on which nerves are affected. 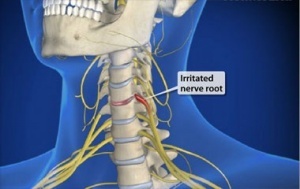 The nerves exiting from the neck (cervical spine) control the muscles of the neck and arms and supply sensation there. The nerves from the middle portion of the back (thoracic spine) control the muscles of the chest and abdomen and supply sensation there. 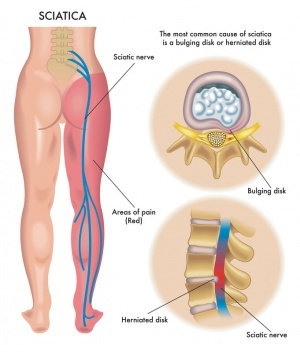 The nerves from the lower back (lumbar spine) control the muscles of the buttocks and legs and supply sensation there. Some patients develop a hypersensitivity to light touch that feels painful in the area involved. Less commonly, patients can develop weakness in the muscles controlled by the affected nerves. This can indicate nerve damage. Radiculopathy's diagnosis commonly made by physicians in primary care specialties, Chiropractic, orthopedics, physiatry, and neurology. The diagnosis may be suggested by symptoms of pain, numbness, and weakness in a pattern consistent with the distribution of a particular nerve root. Neck pain or back pain may also be present. Physical examination may reveal motor and sensory deficits in the distribution of a nerve root. In the case of cervical radiculopathy, Spurling's test may elicit or reproduce symptoms radiating down the arm in cases of cervical radiculopathy. In the case of lumbar radiculopathy, a Straight leg raise (SLR) maneuver may exacerbate radiculopathic symptoms. Deep tendon reflexes (also known as a Stretch reflex) may be diminished or absent in areas innervated by a particular nerve root. For further workup, the American College of Radiology recommends that projectional radiography is the most appropriate initial study in all patients with chronic neck pain . Two additional diagnostic tests that may be of use are magnetic resonance imaging and electrodiagnostic testing. 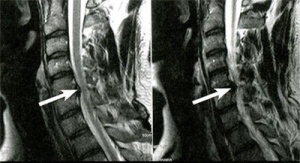 Magnetic resonance imaging (MRI) of the portion of the spine where radiculopathy is suspected may reveal evidence of degenerative change, arthritic disease, or another explanatory lesion responsible for the patient's symptoms. Electrodiagnostic testing, consisting of NCS (Nerve conduction study) and EMG (Electromyography), is also a powerful diagnostic tool that may show nerve root injury in suspected areas. On nerve conduction studies, the pattern of diminished Compound muscle action potential and normal sensory nerve action potential may be seen given that the lesion is proximal to the Posterior root ganglion. Needle EMG is the more sensitive portion of the test, and may reveal active denervation in the distribution of the involved nerve root, and neurogenic-appearing voluntary motor units in more chronic radiculopathies. Given the key role of electrodiagnostic testing in the diagnosis of acute and chronic radiculopathies, the American Association of Neuromuscular & Electrodiagnostic Medicine has issued evidence-based practice guidelines, for the diagnosis of both cervical and lumbosacral radiculopathies. The American Association of Neuromuscular & Electrodiagnostic Medicine has also participated in the Choosing Wisely Campaign and several of their recommendations relate to what tests are unnecessary for neck and back pain. Fortunately, most people can obtain good relief of their symptoms of radiculopathy with conservative treatment. This may include anti-inflammatory medications, physical therapy or chiropractic treatment, and avoiding activity that strains the neck or back. The majority of radiculopathy patients respond well to this conservative treatment, and symptoms often improve within 6 weeks to 3 months. If patients do not improve with the treatments listed above they may benefit from an epidural steroid injection. With the help of an X-ray machine, a physician injects steroid medication between the bones of the spine adjacent to the involved nerves. This can help to rapidly reduce the inflammation and irritation of the nerve and help reduce the symptoms of radiculopathy. While conservative approaches for rehabilitation are ideal, some patients will not improve and surgery is still an option. Patients with large cervical disk bulges may be recommended for surgery, however most often conservative management will help the herniation regress naturally.T he goal of the surgery is to remove the compression from the affected nerve. Depending on the cause of the radiculopathy, this can be done by a laminectomy or a discectomy. A laminectomy removes a small portion of the bone covering the nerve to allow it to have additional space. A discectomy removes the portion of the disc that has herniated out and is compressing a nerve. Pathologies which mimic the signs an symptoms of radiculopathy are. ↑ 1.0 1.1 1.2 1.3 1.4 Eck, Jason C. "Radiculopathy". MedicineNet.com. Retrieved 12 April 2012. ↑ Radhakrishnan, Kurupath; Litchy, William J.; O'Fallon, W. Michael; Kurland, Leonard T. (1994). "Epidemiology of cervical radiculopathy". Brain. 117 (2): 325–35. PMID 8186959. doi:10.1093/brain/117.2.325. ↑ Fuglsang-Frederiksen A, Pugdahl K. Current status on electrodiagnostic standards and guidelines in neuromuscular disorders. Clinical Neurophysiology. 2011 Mar 31;122(3):440-55.